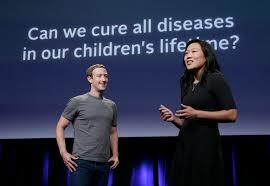 Facebook CEO Mark Zuckerberg and his pediatrician wife, Priscilla Chan, recently announced that they will spend $3 billion over the next decade in an effort to “cure all diseases in our children’s lifetime.” They plan to bring scientists and engineers together to empower the entire scientific community to discover new breakthroughs in preventing and curing diseases of all kinds. While we applaud the generosity and compassion of their initiative, it is highly unlikely that their efforts will result in total success. Any great gains in achieving better health for mankind would be, of course, a wonderful thing, but the odds are likely that there still would be some illnesses to plague the human race. When it comes to spiritual illness (sin), there has been a cure available for centuries. And it is 100% effective for all who receive the remedy for our sins. It is, of course, the blood of Jesus Christ, the savior of the world. “He is the atoning sacrifice for our sins, and not only for ours but also for the sins of the whole world.”—1 John 2:2. This entry was posted in Christian Living, Communion Meditations, Current Events and tagged 1 John 2:2, blood of Jesus, cure all diseases, illustration, Mark Zuckerberg, Priscilla Chan, sacrifice for our sins, salvation, Savior of the world. Bookmark the permalink.